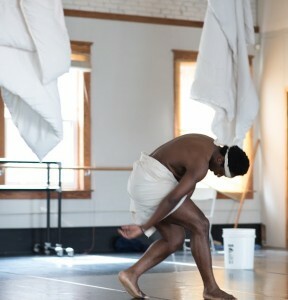 yon Tande of Denizen Arts in rehearsal for Walk the (pink) Elephant in the AS220 dance studio. Photo by Nikki Carrara. yon Tande and Jude Sandy of Denizen Arts in rehearsal for Walk the (pink) Elephant in the AS220 dance studio. Photo by Nikki Carrara. 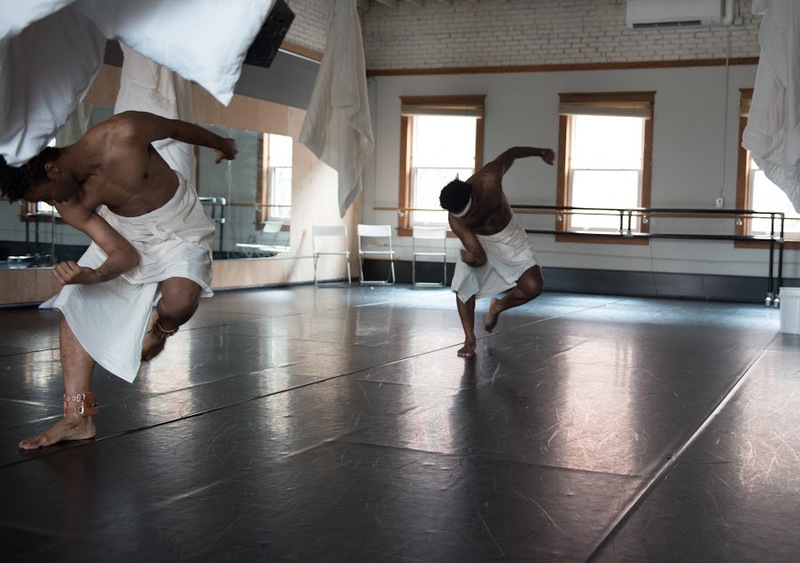 I transcend the three flights of stairs at 95 Empire Street and pass through the dance studio door at AS220, encountering yon Tande and Jude Sandy — together known as Denizen Arts in their creative endeavors — talking through a run of their premiere collaboration, “Walk the (pink) Elephant.” White quilts hang from the rafters and shape the space, which contains a white bucket and a bowl of chalk. They wear only white muslin wrapped around their waists and heads, and Sandy wears two anklets of bells, at times they mark the passage of each step with a soothing clarity. This new work will introduce the final weekend of performance of AS220’s Modern Movements Festival, a mixed bill featuring Denizen Arts, Orlando Hernandez, Amorphous Dance Collective, and Ali Kenner Brodsky + Andy Russ. In the spirit of experimentation and pushing boundaries, the audience will be on the move for this show. 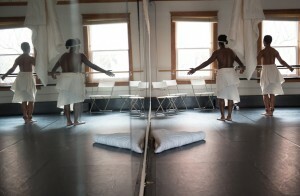 Beginning at the third floor dance studio for the healing rituals of this work, then moving to the gallery space on the second floor, and finally into the blackbox theatre. Jude Sandy: In some ways it’s more than a dance and in some ways it’s less than a dance. To me, in some ways, it’s a bit of not being consumed by virtuosity in dance. My opinion is that virtuosity has become distancing to the audience, what we are communicating is that ‘you can’t do this’ and what I’ve felt most moved by in performances is seeing artists struggle and sometimes fail. That feels more exciting than watching someone do something that I will never be able to approach. That establishes an intimacy between the person doing the work and the person seeing the work. yT: Part of this is us dealing with our own issues [around] the loss of these men, then also how to invite the larger community into this process of healing. For us, it’s got to be more than a dance. It’s got to be a ritual. This journey is about figuring out how we honor them. What rituals do we use? How to translate dance and theatre and performance and break it down to a procedural activity. When you were saying that, Jude, I was thinking about the intimacy of procedure. How does the knowing of a process create an intimacy in terms of ‘we see ourselves as conductors, facilitators.” This is our job — to allow this conjuring to happen. In a way, it’s removed from emotion and passion, and really down to the bare bones of, ‘You need to wrap yourself in the blanket and you need to roll three times. You need to write the names here. When you write the name then you go over here and you do this thing.’ I’m interested in the intimacy of the mundane. What are we doing here and why are we doing it? Having that kind of responsibility is major. This is a really serious matter and we want to do it justice. Nikki Carrara (Motif): Who are the men you are referring to? JS: Artists of color who died because of the onslaught of the AIDS epidemic in the 80s. And realizing that we lost a generation of people that would have mentored another generation of artists, and in a lot of ways our generation therefore is orphaned. Trying to figure out how to create a palpable connection to people who aren’t here, who can’t advise us, who can’t make their presence felt in our work in a direct way because we don’t have a direct connection to them. So it’s about trying to call them up, give them the honor they are due, in the hope that they will remain present to us. yT: There was a dancer in the Graham company named George White Jr. Many of her dancers died of AIDS. As we started looking for obituaries, we realized there was no obituary for George White. The last mention of him on the internet is from a performance in 1983, and then that was it. You realize that so many of them got sick and then just disappeared. Because at that time, people were so afraid, then didn’t’ know if you could just get it by touching — so people were just quarantined. You would think that someone with such public stature would have at least something. That really made us think, ‘Wow, there are probably so many that we don’t know about, who are only known by virtue of people who knew them and were around them.’ Can you imagine being such a huge star … and then, nothing? It’s really, really sad. We are approaching all of these ideas and trying to find a way to deal with them. NC: Are there other rituals that exist already that you have sourced for this work? YT: I always go, because it’s what I know, to Haitian Vodou, practices of ancestral veneration, honoring the ancestors, pouring libation, calling the names of those people who have passed on. This bucket here is an abstract of a libation. And then putting the names on the walls is a way to do it without actually calling out the names, so that the names are always present just by virtue of us writing them. Also we were looking at Jouvert from the Trinidad and Tobego carnival practices [Sandy was born and raised in Trinidad] where you are literally ushering the dead to their final resting place. We like that idea of celebrating, rather than mourning. NC: The audience is coming to something that is more than a dance, or less than a dance. Are you going to address that or are you going to just let them have this experience of the ritual you are facilitating? YT: In here, it will be like that you are coming into a shrine, a sacred place, so we are really creating that feeling. So even if you don’t know what to do or how to do, you know that there’s something. And we’re gonna give you ways, like the chalk, that will clue you in and welcome you. So that you will know the appropriate actions. Featuring artists from the AS220 Modern Movements Dance Festival, moderated by Mellon Post-Doctoral Fellow at Brown University, Sarah Wilbur. April 19th, 4pm.